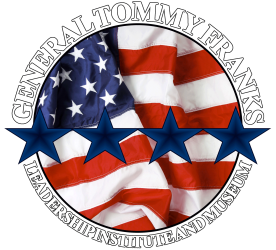 I want to take this time in order to introduce myself as the new executive director for the General Tommy Franks Leadership Institute and Museum. The characteristics of leadership, patriotism and service that embody the career and legacy of General Tommy Franks are what attracted me to this great opportunity. I possess more than 15 years of experience in project management, training development, strategic operations and personnel supervision. Prior to working at the General Tommy Franks Leadership Institute and Museum, I served as a senior military science instructor at Oklahoma State University Army ROTC, military history instructor and assistant professor of military science at the University of Oklahoma Army ROTC, as a Division G3 Plans Officer, as a Brigade S3 Operations Officer, a Battalion S3 Plans Officer and a Platoon leader in the U.S. Army. This organization has a proven track record of success in instilling the values of Leadership, Patriotism, and Service within America’s youth. This is only made possible by the generous contributions from individuals and organizations. This holiday season I am thankful for YOUR continued support as together we make 2016 a great year.